Irish technology start-up, Joulica, this week announced a significant expansion of its operations headquartered in Galway, creating 45 new jobs over three years. The announcement was made on Monday at Joulica’s headquarters at NUI, Galway, by Heather Humphreys, Minister for Business, Enterprise, and Innovation, together with Joulica CEO Tony McCormack and Mark Christal, Regional Entrepreneurship Manager at Enterprise Ireland. The development is supported by the Government through Enterprise Ireland’s Research, Development and Innovation Fund. 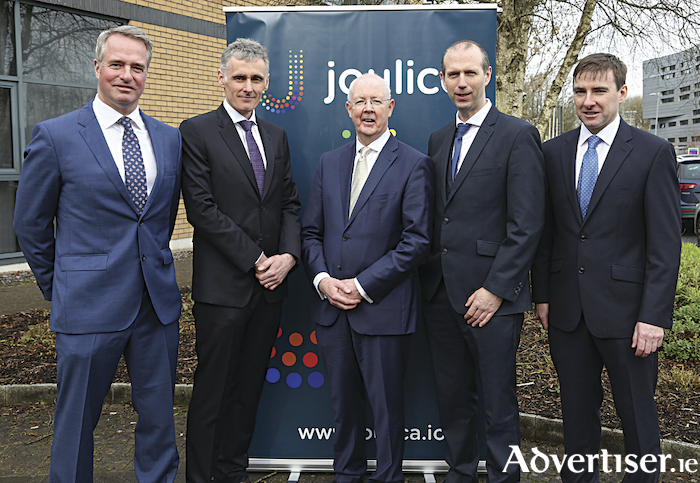 Founded in 2016 and based in the Business Innovation Centre on the campus of NUI Galway, Joulica has grown rapidly and enjoyed strong commercial success based on its expertise in the Customer Experience domain, real-time analytics and cloud-native software development. The high-skill jobs announcedwill add 45 to the existing 25 staff currently employed by Joulica. Joulica is seeking experts in software, data analytics and business development to serve new product development opportunities in the US and Europe. Speaking at the announcement, Minister for Business, Enterprise and Innovation, Heather Humphreys, TD, said that ahis time last year, Joulica had 11 employees. “Since then, they have increased that number to 25, and over the next three years, they will increase it again to 70. This wonderful achievement is a testament to the innovation and dedication of the team. “Companies like Joulica are vital components of a robust regional economy, something that the Government is committed to supporting. I would like to congratulate Tony McCormack, Joseph Smyth, Diarmuid Leonard and the team at Joulica on this remarkable achievement and wish them every success as their business continues to grow,” she concluded. Speaking at the announcement, Tony McCormack, CEO of Joulica said this marks a significant landmark for Joulica and demonstrates the depth of talent available to innovative technology start-ups establishing R&D centres in Galway city. “The success we have enjoyed to-date is a testament to the world-class talent and exceptional skills of the Joulica team, together with the unwavering support provided by Enterprise Ireland, our advisors and mentors. Mark Christal, Manager – Regions and Entrepreneurship, Enterprise Ireland said innovation and being competitive is crucial for Irish start-ups to grow and build scale both here and on an international level. “It is becoming increasingly clear that businesses are facing uncertainties and challenges that could impact their growth, and Joulica is an excellent example of a company that has stayed on the pulse and identified solutions to allow them to scale in international markets and realise their global ambition. At Enterprise Ireland, we are committed to supporting regionally-based companies like Joulica to plan, innovate and compete and we look forward to continuing our work with Tony and the team on their growth trajectory.” he added. APP Kirrane Auctioneering awarded wins big at the All-Ireland Business All-Star accreditation at Croke Park. Page generated in 0.2073 seconds.